WASHINGTON, DC, March 21, 2012 (ENS) – The U.S. Supreme Court ruled Wednesday that landowners can file a lawsuit to challenge a federal government compliance order under the Clean Water Act. The decision upholds the interests of corporations and limits the power of the U.S. Environmental Protection Agency. Justice Antonin Scalia wrote the opinion of the court, which was asked to decide whether Michael and Chantell Sackett may bring a civil lawsuit under the Administrative Procedure Act to challenge an administrative compliance order issued by the U.S. Environmental Protection Agency under the Clean Water Act. The court held that the Sacketts may immediately litigate their jurisdictional challenge in federal court. “There is no reason to think that the Clean Water Act was uniquely designed to enable the strong-arming of regulated parties into ‘voluntary compliance’ without the opportunity for judicial review – even judicial review of the question whether the regulated party is within the EPA’s jurisdiction,” Justice Scalia wrote. This case turns on a dispute about the scope of navigable waters of the United States subject to the Clean Water Act enforcement regime. The EPA’s order asserts that the Sacketts’ property is subject to the Act, and that they have violated its provisions by placing fill material on their property, a 2/3-acre residential lot in Bonner County, Idaho. 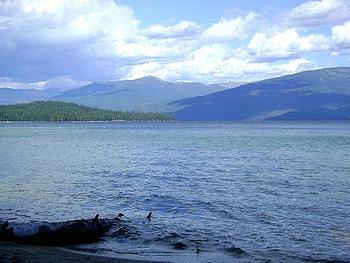 The Sacketts’ property lies just north of Priest Lake, but is separated from the lake by several lots containing permanent structures. In preparation for building a vacation house there, the Sacketts filled about half an acre of their lot with dirt and rock. Several months later, they received from the EPA a compliance order directing them immediately to restore a wetland on the property under an EPA work plan because Priest Lake is a “navigable water” of the United States within the meaning of the Act. The EPA decided that by causing fill material to enter waters of the United States, the Sacketts have engaged, and are continuing to engage, in the “discharge of pollutants” from a point source, which is prohibited by the Clean Water Act without a permit. The Sacketts denied that their property had ever contained a wetland. They objected to being forced to obey a compliance order without a court hearing. Justice Scalia wrote, “The Sacketts are interested parties feeling their way” in trying to determine limits on the reach of the Clean Water Act. The Sacketts, who do not believe that their property is subject to the Act, had asked the EPA for a hearing, but that request was denied. They then brought a lawsuit in the U.S. District Court for the District of Idaho, seeking declaratory and injunctive relief. They contended that the EPA’s issuance of the compliance order was “arbitrary [and] capricious” under the Administrative Procedure Act and that it deprived them of “life, liberty, or property, without due process of law,” in violation of the Fifth Amendment. The district court dismissed the claims for lack of subject matter jurisdiction, and the United States Court of Appeals for the Ninth Circuit affirmed the lower court’s decision. The Supreme Court ruled only on whether the dispute may be brought to court by challenging the compliance order and did not attempt to resolve the dispute on the merits of the case. The Supreme Court’s decision states that the couple has a right to go to court to get a pre-enforcement review of the compliance order without waiting for the EPA to sue them for violating the order in order to make their case. Justice Scalia said that since the EPA’s decision was final and the couple faced potential fines of $75,000 a day, their only adequate remedy was to bring a civil lawsuit against the federal agency. The court concludes that the compliance order in this case is final agency action for which there is no adequate remedy other than Administrative Procedure Act review, and that the Clean Water Act does not preclude that review. Justice Samuel Alito’s wrote a concurring opinion in which he agreed with the decision but observed that the reach of the Clean Water Act is unclear. “Real relief requires Congress to do what it should have done in the first place: provide a reasonably clear rule regarding the reach of the Clean Water Act,” wrote Justice Alito.